This will be my 17th PMC but my first riding as Tina Rose. I am so excited about taking this next step on my journey. 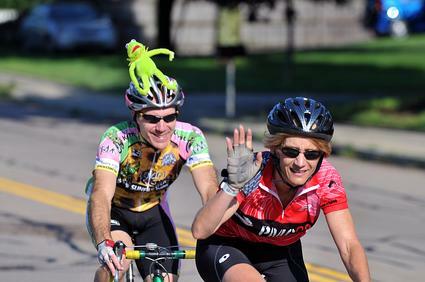 It's hard to imagine that this is Team Kermit's 13th year riding in the PMC. 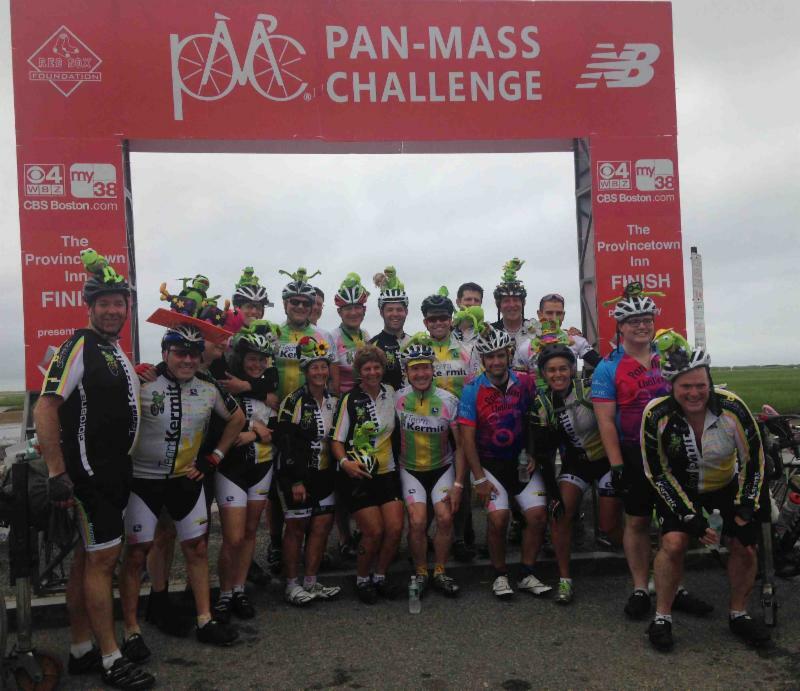 When eight of us founded the team in 2005 and rode in our first PMC I could never have imagined how far we've come. Our team is now 62 riders of all ages, sexes, sizes, and riding abilities. We train together, make meals together, go to plays and the movies together, and raise money to fight the horrible scourge of cancer. We are a family. 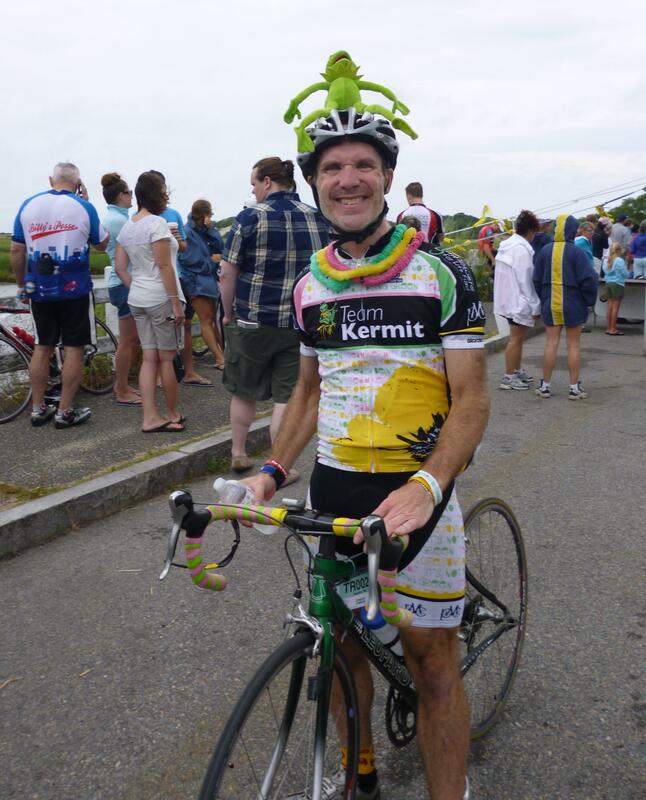 Click here to read more about Team Kermit: http://profile.pmc.org/TT0079. My profile picture above is at the Babson Finish, only the second time I finished there. With me on the poster is Declan O'Rourke, our pedal partner. Declan is a bright, funny, creative, and fun-loving 11-year-old. 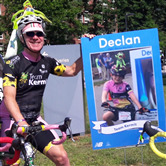 When he was only 18 months old, Declan was diagnosed with the same brain tumor that killed our friend Jared Branfman in whose memory Team Kermit rides and in whose name the Sunflowers for Life Fund exists. The dollars that you and so many generous sponsors have donated over the years funded the research to identify Declan's cancer, treat it, and ultimately save his life. Our collective efforts don't get any more important than that. Very sadly, all of us have been touched by cancer, either directly ourselves or with a family member, friend, or co-worker. One friend was diagnosed for the second time with breast cancer. Another friend lost his son leaving behind a wife and two young children. A third friend was diagnosed with ovarian cancer. And yet another friend died from pancreatic cancer. My list goes on as does everyone's. Please donate whatever you can to my PMC. I've committed to raising $4,900 which is a big fundraising goal. With your help, your love, and your kindness, I'll get there. Click the DONATE button here and follow the steps, or send a check payable to The Jimmy Fund/Dana Farber Cancer Institute to 198 School Street, Watertown, MA 02472.